Some say “lean reduces waste, six sigma reduces variation” but this is a misconception. Both aim to reduce waste and both rely on a variety of common sense tools and sophisticated statistical methods to improve quality and reliability. In fact the Toyota Production System was built on a very strong foundation of TQC (Total Quality Control) which persists to this day as part of the QC Circle activity, Toyota Business Practice (TBP) lean problem solving approach, and all fact-based kaizen activity. The 7 QC tools are at the heart of both the six sigma and lean process improvement methods. Learning how to use these seven tools plus a comprehension of basic statistics is essential to long-term success for any process improvement endeavor. Gemba Academy is pleased to announce the addition of the 7 QC Tools Course. Within the twenty two video modules we offer detailed explanations on what each of the 7 QC Tools are and how they are used them for improving processes. In this course we placed an emphasis on examples from transactional, administrative and healthcare environments with the hope that more non-manufacturers will be able to apply lean thinking effectively. The first overview module is may be viewed free of charge simply by creating a user account. The seven key quality control tools and the idea of the essential 7 QC Tools was put forth by Tokyo University Professor Kaoru Ishikawa over 50 years ago. His work helped make statistics much more practical and accessible and this resulted in the acceleration of the adoption of Dr. Edwards Deming’s quality improvement philosophies in Japan. The seven quality tool are the graph, the Pareto chart, the histogram, the scatter diagram, the cause and effect diagram, the control chart, and the check sheet. In module 2: QC Tool 1 – The Graph we learn about 5 useful types graphs, and when to use each one. In modules 3 – 7: we learn how to create bar charts, broken line graphs, pie charts, band graphs and radar charts using Microsoft Excel. Module 8: QC Tool 2 – The Check Sheet teaches how to leverage this simple but powerful tool in both manufacturing and front office situations. Module 9: QC Tool 3 – The Pareto Chart teaches the history and application of arguably the simplest and single most important problem solving tool available. In module 10: Creating a Pareto Chart in Sigma XL we demonstrate exactly how to create a Pareto chart in the Sigma XL program. 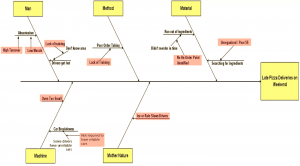 the QC tool commonly referred to as the Fishbone Diagram, the Ishikawa Diagram, or the Cause & Effect Diagram, and how it is extremely helpful at identifying root causes. In module 12: Basic Statistics we learn what statistics are and how they can help us when used properly. Module 13: Measures of Central Tendency teaches the 3 measures of central tendency are as well as how to calculate them manually. In module 14: Measures of Dispersion we learn what the 3 measures of dispersion are as well as how to calculate them manually. Module 15: Generating Descriptive Statistics teaches us how to quickly generate descriptive statistics using either Microsoft Excel of Sigma XL. Module 16: QC Tool 5 – The Scatter Diagram teaches what the Scatter Diagram is and how to create one, as well as introducing Simple Linear Statistics such as R Squared and how to build predictive statistical models. In module 17: Creating Scatter Diagrams and Regression Statistics we learn exactly how to create Scatter Diagrams while also generating Simple Linear Regression statistics such as R Squared and Predictive models. Module 18: QC Tool 6 – The Histogram teaches what the histogram is and how it can help you better understand your front office or manufacturing related process. In module 19: Calculating Cp and Cpk we learn what Cp and Cpk are as well as how to calculate them. In module 20: Creating Histograms and Cp / Cpk Statistics we learn how to easily generate histograms as well as Cp and Cpk statistics using Sigma XL. Module 21: QC Tool 7 – The Control Chart teaches what the control chart is as well as the difference between common and special cause variation. Module 22: Creating Control Charts in SigmaXL teaches how to quickly generate both Individuals and Individuals + Moving Range Control Charts using Sigma XL. The course is taught by Ron Pereira, a certified and practicing Six Sigma Master Black Belt (MBB), lean implementation leader and co-founder of Gemba Academy. He is an expert trainer who has taught this countless times over the past 15 years. Ron’s delivery, use of practical examples and skill at demystifying statistics makes this a truly valuable course. Whether as a complement to your existing six sigma yellow belt or green belt training program, as a quick video reference for teaching employees basic statistics and quality control tools, or as part of a leadership development curriculum, we are confident that the 7 QC Tools course will be an important asset for your continuous improvement learning. 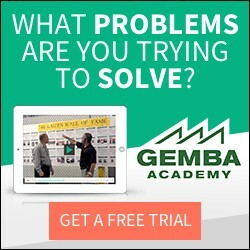 We always enjoy hearing from you so please feel free to email us at academy@gembaacademy.com, call us at +1-866-599-1398 or visit www.GembaAcademy.com and start learning within minutes.